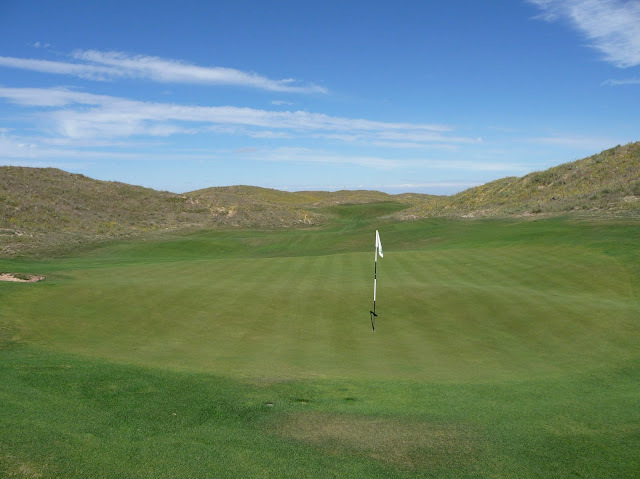 Standing on the 16th tee for the first time, you may not have any idea where the green is or what direction you should be headed. 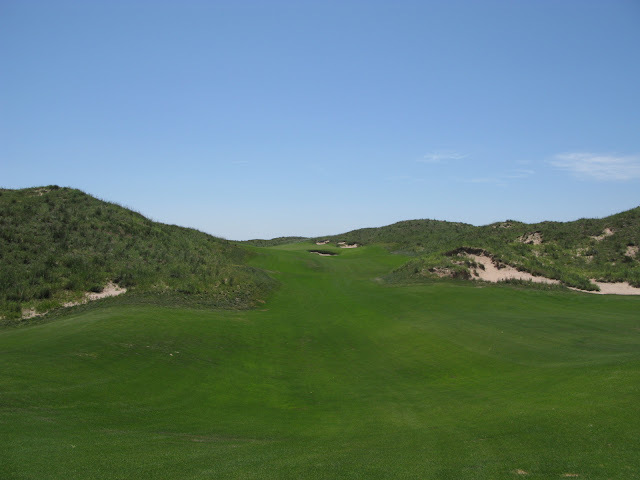 It's a unique par 5 that takes a sharp 90 degree turn at a very narrow spot between the dunes. 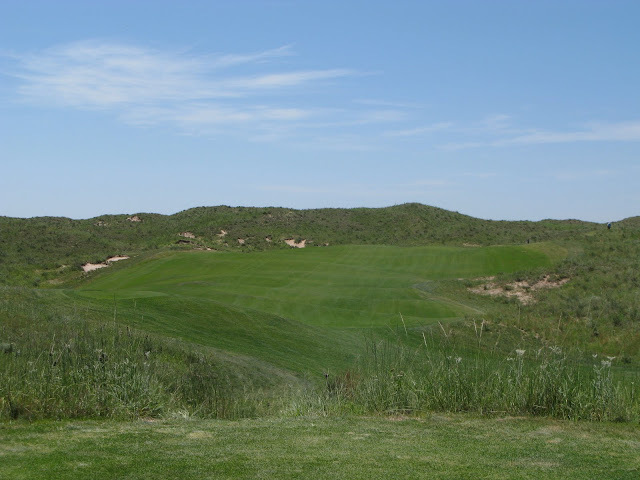 The hole plays dramatically different depending on the tee you select and the direction of the wind. 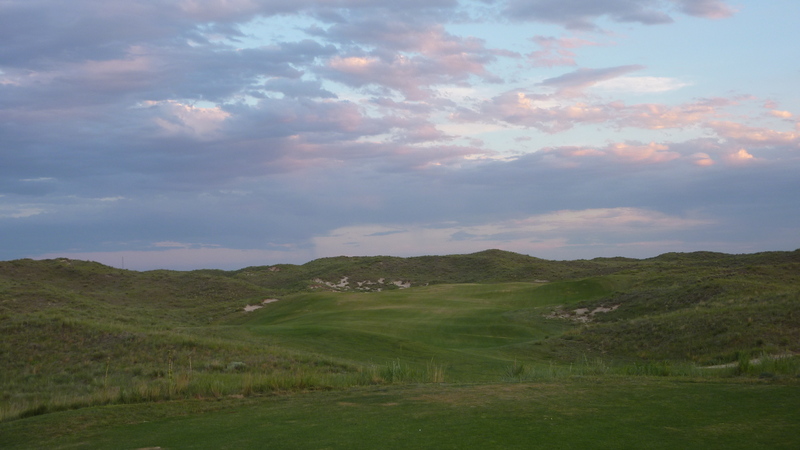 From the tips or into the wind, it's probably a three-shot hole. Downwind, or from one of the forward tees, it's go time with an aggressive drive down the left side of the fairway. As mentioned, the neck is everything on this hole. 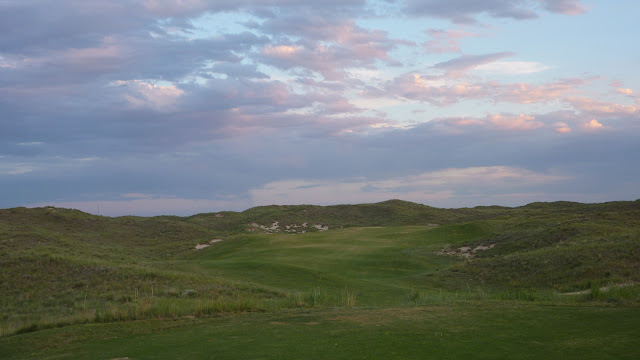 Big drives may end up finding the 'bowl of achievement', with a bonus kick to less than 175 yards in and a clear view of the green through the neck. Poor drives may force the golfer to lay-up into the bowl because there is a bit of carry required to clear the neck on the other side. 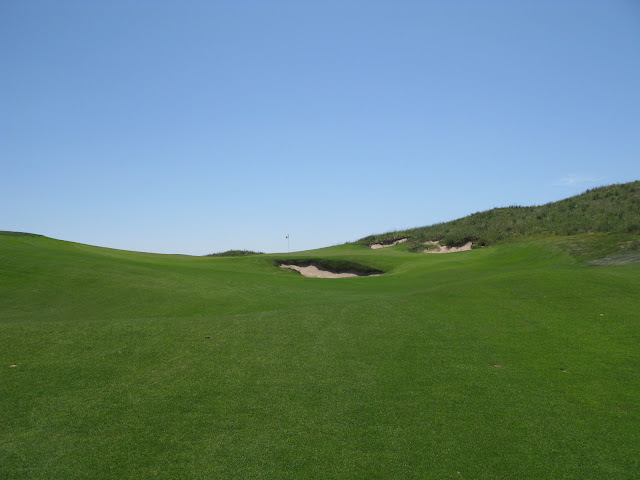 Most playing it as a three shot hole will hit to the right-center of the fairway past the neck, leaving no more than 100 yards to the green. Strong drives down the left side but short of the bowl will leave about 200-210 yards to the pin in a green light situation. 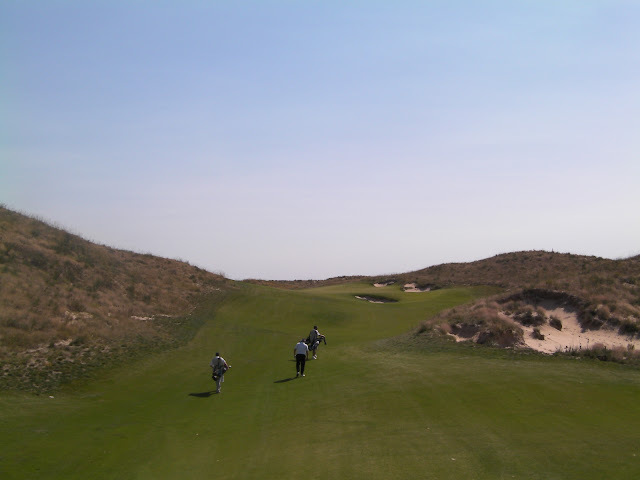 Going for it in two requires a confident stroke as it likely means a long carry over the large dune down the left side. Doak put quite a bit of room to miss long and left, but that will likely leave a dicey chip back to a green sloping away from you. Most second shots will funnel towards the deep front greenside bunker. The right greenside bunkers are not a bad place to be in two. 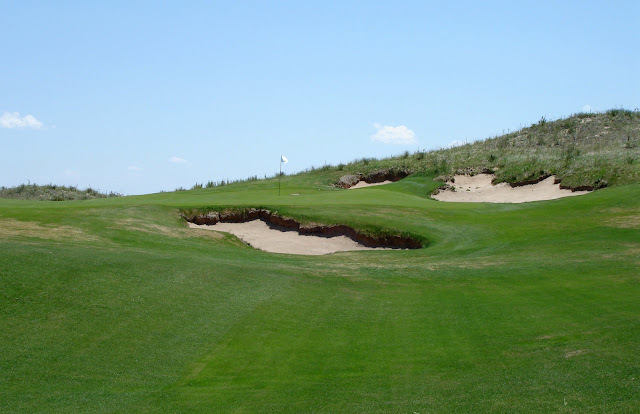 The 16th is a wonderful hole, a par 5 which emphasizes position over power. 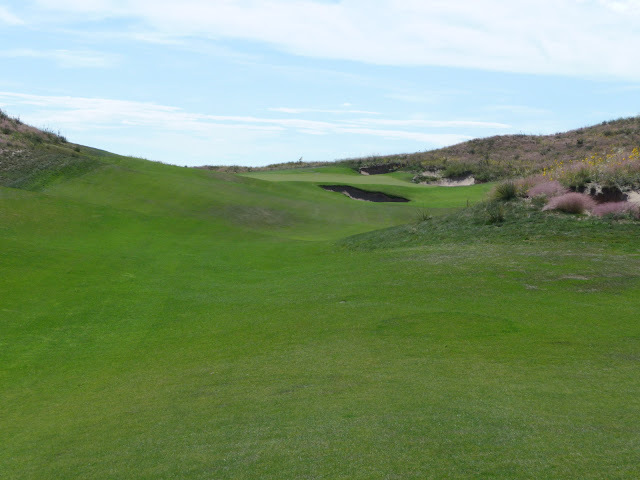 The fairway is extremely wide, but the preferred line is left center, left edge. The further left you are off the tee, the better angle you have for the second shot. The further right you are off the tee, the harder the second shot becomes, and thus, the harder the hole becomes. If the first two shots can be executed correctly, you are left with a third shot from 80 yards, to an elevated, shallow green. From here, birdie is a real possibility. The golfer can make a 4 here just as easily as he can make an 8. The 16th represents the last real birdie opportunity the golfer will see in the round.